The bitter enmity between Elizabeth the First and Mary Tudor, the daughters of Henry VIII (not to mention the conflict between their mothers Anne Boleyn and Katherine of Aragon) makes the squabbles between modern-day royals seem small beer indeed. Mary and Elizabeth, the two young princesses, have a common goal: to be Queen of England. To achieve this, they need both to win the love of the people and learn how to negotiate dangerous political pitfalls. Gregory recreates this era with tremendous colour, and she makes the court an enticing but danger-fraught place. Into this setting comes the eponymous fool, the youthful Hannah, who (despite her air of guileless religiousness) is not naive. She soon finds herself having to deal with the beguiling but treacherous Robert Dudley. Dispatched to report on Princess Mary, Hannah discovers in her a passionate religious conviction (to return England to the rule of Rome and its pope) that will have fatal consequences. As with The Other Boleyn Girl, Philippa Gregory takes the bones of the story from historical fact, using actual historical figures and events throughout the tale as well as creating a few from her own imagination, and manages to breathe life into them; bringing the Tudor period to the reader in an immensely enjoyable and accessible way. The fear and paranoia felt by all in England at that time is brought to the fore and narrated by Hannah, who would be taken as a heretic for her religion, which she must hide from those around her, and through her gift as a seer she is elevated to a position where she may feel safer, but is, in fact, in danger of being arrested for treason. The complexity of relationships is a focal point here (Hannah loving Queen Mary but admiring Princess Elizabeth; being enchanted by Robert Dudley but fighting her growing feelings for Daniel Carpenter) and the subtleties are intricately woven into the plot to make this a richly rewarding story with more to offer than just historical detail. It is a tale about following your heart and being true to yourself, even when faced with danger from all sides, learning to live with your decisions and grow as a person because of them. Although there is much detail, Gregory doesn’t allow it to bog down the narrative and she manages to draw the reader into it in such a way that you could believe you were actually there. 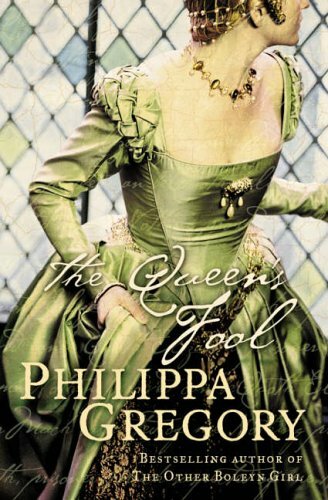 It is very well-written and, although not quite as intriguing as The Other Boleyn Girl (in my opinion), The Queen’s Fool has convinced me to get hold of as many of Philippa Gregory’s other works as I can as soon as possible.